Why Can’t I Send Email When Using Certain Internet Connections? These days we all expect our email to work flawlessly when we’re outside of the office, regardless of how we’re connected. Occasionally though, a change of connection is all it takes to cause issues. 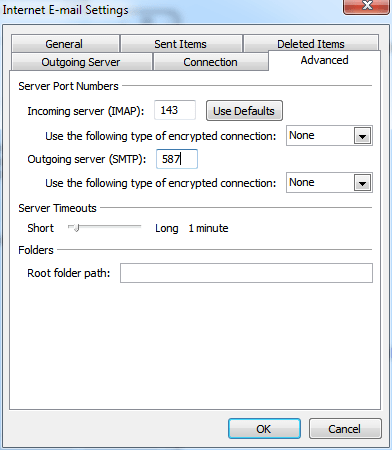 In this post I take a quick look at why, if you connect to your own mail server using an SMTP connection (not applicable to ActiveSync users) from your mobile device, laptop or even desktop machine, you might experience problems with sending email. Oh, and what you can do about it of course! The majority of your standard email clients will probably use SMTP (Simple Mail Transfer Protocol) to send email to a remote mail server (in our case it’s usually MDaemon). 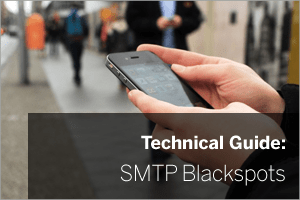 In its most basic form, SMTP runs over port 25 and is unencrypted. ‘Back in the day’ this type of traffic would probably have been allowed all over the internet with no restrictions whatsoever. These days though, it’s a little different because of the big increase in spam generated by bots, a large proportion of ISP’s no longer allow end users to send SMTP mail publicly. Instead users are expected to be using the ISP’s own SMTP server as a gateway. If you’re a home user of course, using your own ISP to send email makes sense. If you run your own mail server though and swap between ISP’s multiple times a day, it’s not ideal to be changing your outgoing server configuration each time you connect. It’s also possible if you’re on a public connection that you may not even know the connection details you need in any case. The following advice is mainly applicable if you’re using your own mail server – if you use a mailbox from your ISP for example, only the webmail bit is relevant. Ok so this isn’t always going to be an option available to you, particularly if you use a laptop or desktop machine but if you are able to switch to an ActiveSync connection that is the ideal workaround (available for both MDaemon and Exchange). 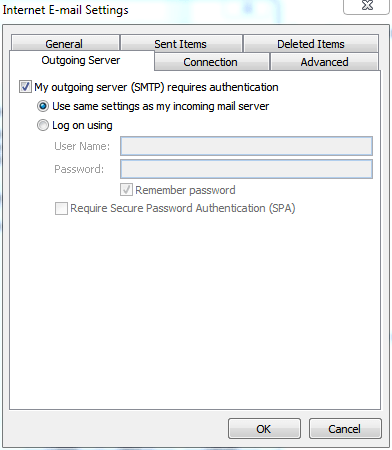 ActiveSync uses a completely different connection protocol, however if you’re using Microsoft Office (pre 2013) or Outlook Connector with MDaemon then SMTP must be used in some form to send email. At this point I’ll forgive you for thinking my specialist subject is the bleedin’ obvious. Well yes, this isn’t so much of a workaround, more of an obvious suggestion but you’d be amazed how easily it’s overlooked if you’re under pressure and panicking that your mail’s not working as it should be. MDaemon has Worldclient, a webmail client with all of the Exchange-like features you’d expect in Outlook, and any email provider worth their salt will have a webmail interface for their mail accounts so one option is to log in and use that for sending mail instead of Outlook. Because this connection problem arises from ISP’s performing a very simple block on SMTP traffic over port 25, if we use a different port, it’s a lot less likely to happen. I’m not an Exchange expert so this article will go on to explain in more detail how to do this in MDaemon, but I’m not going to attempt the Exchange walk-through I’m afraid. MDaemon actually comes pre-configured to answer SMTP traffic over multiple ports and the Mail Submission Agent (MSA) service that we’re going to swtich to is designed to use port 587 to answer SMTP requests from clients. In order to switch to using this port, two conditions must be met. First the port needs to be publicly accessible in the same way port 25 was. So as I mentioned, this would usually require opening up firewall rules and adding a NAT rule at the site where MDaemon is located. MDaemon Itself is actually already configured to answer on port 587 so nothing needs to be configured in the software – you will however need to update the email client to use port 587 instead of port 25. The other requirement for using the MSA port is that all sessions use SMTP Authentication and log in before sending email. This is an option in the email client and you should find there is an option to just use the same details being used for collecting email over IMAP or POP3. Other email clients should have similar options. Switching to the MSA port should get around most ISP blocks and allow you to send email like you could over plain port 25 SMTP, but ultimately it is the ISP who controls which traffic to block and which to allow. In some rare occasions, only HTTP and HTTPS traffic is allowed, so in those cases where you’re caught out, if you can’t arrange an ActiveSync connection, webmail is your preferred option. I hope you found that useful – please let me know if you’ve got any questions in the comments. Thank you for the article about the problems with e-mail, you helped me a lot. phew..port 587 solved my problem, thanks a lot.